Dishonest and incapable of seeing that it was within themselves that there was and still is the seed of their own destruction, they tried to make us disappear with lies and complicit silence. We, who never went away, despite what media across the spectrum have been determined to make you believe, resurge as the indigenous Zapatistas that we are and will be. Our work has the double satisfaction of providing us with what we need to live honourably and contributing to the collective growth of our communities. Fourth – We will continue to maintain our critical distance with respect to the entirety of the Mexican political class which has thrived at the expense of the needs and desires of humble and simple people. The bad governments which belong to the entirety of the political spectrum without a single exception have done everything possible to destroy us, to buy us off, to make us surrender. PRI, PAN, PRD, PVEM, PT, CC and the future political party RN have attacked us militarily, politically, socially, and ideologically. [i] The mainstream media tried to disappear us first with opportunist and servile lies followed by a complicit and deceptive silence. Those they served, those on whose money they nursed are no longer around and those who have succeeded them will not last any longer than their predecessors. As was made evident on December 21, 2012, all of them failed. So, it’s up to the federal, executive, legislative and judicial governments to decide if they are going to continue the politics of counterinsurgency that have only resulted in a flimsy simulation clumsily built through the media, or if they are going to recognize and fulfil their commitments by elevating Indigenous Rights and Culture to the level of the Constitution as established in the “San Andrés Accords” signed by the Federal Government in 1996, which was at the time led by the very same political party that today occupies the executive office. Mexico. December of 2012 – January of 2013. Imagine close to 50,000 people marching in absolute silence, in five different townships, from two to five hours apart. Not a word, nor even a greeting. Just a raised fist in a sign of strength, determination and unity. Streets overflowing with masked faces and wordlessness. It is a huge demonstration of force–the largest in the entire history of the Zapatista movement–just days before the 19th anniversary of their first public appearance and 30 years since their founding. What’s behind a mass mobilization like this, with no more resources than what the communities themselves can offer? Without the spending accounts of political parties or other organizations that only mobilize with government money? The Zapatista Army of National Liberation (EZLN, by its Spanish initials) has taken a stance again. It wasn’t a surprise like the first dawn of 1994, since the Dec. 21, 2012 reappearance had been announced beforehand. But no one knew it would be in silence and with greater strength than two decades ago. Twenty years ago no one imagined the EZLN even existed and although the state had enough information to predict the attack, it preferred to wait to act to avoid dampening the parade of its entrance into the First World with NAFTA. Those days of January 1994, the government immediately ordered military operations, but it had already been surprised, along with the rest of the world. The same thing happened 19 years later, this time without arms. With the federal army deployed throughout the territory with the pretext of the war on drugs, Chiapas is the most militarized state in the country. In a show of defiance, the Zapatistas retake the streets and the two flags that they have always flown—the EZLN flag and the Mexican flag—wave freely. They carried these two flags in 1994, they have walked with them throughout the years, they always bear them. They earned the right to traverse the country with their message of rebellion, with an army that backs them up, from the first twelve days of combat. No one can deny then that right. Five presidents have ignored their demands. All have wanted to annihilate them, by bullets or with expensive government counterinsurgency programs. Slander and smear campaigns have surrounded them. The last year has seen a flurry of rumors of the death or illness of the spokesperson and military chief, subcomandante Marcos, who now has proved alive and well, like the tens of thousands of indigenous people of the organization who make up the backbone of the movement. The silence of the march and the brief communiqué afterward revived expectations. What’s next? When? Not only those from below are asking, Enrique Peña Nieto must also be wondering, along with the many-colored and many-faceted powers that be, since it is clear that even though they avoid speaking their name and pretend that therefore they don’t exist, the demonstration of Dec. 21 is only the beginning. They’re there, and they’re legion. They are rebels. No one can buy them off. They are not divided. Their spokesperson is still their spokesperson. They are coming. They surprised Carlos Salinas de Gortari in 1994, in the middle of his New Year dinner and what was not only the end of his administration, but also, and for the elite, the beginning of a new era–one that was not supposed to include an insurrection from below. A declaration of war and the military takeover of seven municipal seats by an indigenous army was Salinas’ send-off. Ernesto Zedillo was greeted in office with the message: “Welcome to the nightmare”. This was followed by a position that has remain unchanged since then: “You should disappear, not only because you represent a historic relation, a historic aberration, a negation of humanity, and a cynical cruelty; you should disappear also because you represent an insult to the intelligence. You made us possible; you made us grow. We are your other, your Siamese opposite. To get rid of us, you must disappear.” The Zapatistas began the Zedillo administration with the Third Declaration of the Lacandon Jungle, in which they proposed the creation of a Movement for National Liberation. The third presidency the Zapatistas experienced was headed by Vicente Fox Quezada, of the National Action Party (PAN), who broke with more than 70 years of PRI hegemony. They told Fox from the first day of his government: “There should be no doubt. We are your opponents.” With this message one of the most important mobilizations of the Zapatista movement began—the March the Color of the Earth. Gloria Muñoz Ramírez is the director of Desinformémonos, http://www.desinformemonos.org, where this article was first published in Spanish and a contributor to the CIP Americas Program at http://www.cipamericas.org. “For those from above, the calendar is made from the past. To keep it there, Power fills it with statues, festivals, museums, ceremonies, parades. All in order to exorcise the past, that is, to keep it in the space of that which has been, and not that which will be. For those from below, the calendar is something forthcoming. It is not a bunch of pages scattered about out of boredom and despair. It is something for which we must prepare. In the calendar from above, it is held; in the one from of below, it is built. In the calendar from above, it is celebrated; in the one from below, it is fought for. In the calendar of above, history is manipulated; in the one from below, it is made. In the calendar from above, prizes buy consciences and words; in the one from below, they are silenced. In the calendar from above, grey mediocrity is lord and master; in the one from below, all colors are painted. In the calendar from above there is only contempt for those from below, and a belief that they can do this with impunity. In the calendar of below there is rage against those from above. The Zapatista movement not only opens the path or the hope of the present or the future, not only for the Mexican people, but for all the peoples of the world. The “¡Ya Basta!” (Enough!) gave us a sign of hope, not only for Mexicans, but for the men and women, young people, children and the elderly of other communities of the world, as well. We know how to struggle and we struggle from below (…) since we do not need the national and international laws of the bad governments, which only strengthen the neoliberal capitalist model and which do not know how to recognize and respect the autonomy our people have been exercising, as a historical right–one that has without a doubt always belonged to us: our right to self-determination and autonomy, as well as to our land and territory, which are not for sale or subject to negotiation. It is necessary to strengthen with our lives the struggles of our peoples, as the very life of our mother earth. And the band kept playing. The sinking of the Titanic was unavoidable. To ignore it was foolish. But the band kept playing. His performance on the first day is a blatant illustration of this peculiar kind of blindness. It shows the gap that has opened between the political classes and the people, and it also reveals his dangerous detachment from reality, the irresponsible and short-sighted way in which he is preoccupied with his mafia-style interests in the short term, while ignoring the depth of the economic , social and political crisis in which we find ourselves. His discourse about the country is currently showing the worst symptoms of a populist authoritarianism which has been installed against all odds. It is conceived as a triumph of optimism over irresponsible reality, with the evident intention of generalizing this blindness. The band will continue playing until the instruments and musicians sink with the ship. It is particularly difficult not to hear the roar of the collapse, which is observed worldwide and has been precipitated very sharply in Mexico. Those who have climbed the ladders of political power, however, will persist in their self-interested deafness … while they can, for as long as they can. But the rest of us cannot continue to be deaf. We need to respond. “I hate to say I told you so, but I told you so,” Subcomandante Marcos said years ago. The Zapatistas have repeatedly warned us of what would happen if we did not respond. We did not respond. It happened. They described in various ways the mess we are in today. They anticipated, before anyone else, the series of crises which have been happening and the destruction which they would bring to the political classes, to the country itself, to the social fabric … They offered with strength and clarity options for change, without dogmatism or imposition. We did not take them. The new call from the Zapatista Army of National Liberation (EZLN) needs to be heard by all those who, from below, try to resist the dominant horror and to create another possibility. If only it could be heard by those who still harbour the fantasy that an electoral change might be enough to remedy it all, those who can only think and organize within the framework of the political parties and institutions and who still believe that anti-capitalism is a bad word. It is useful to show again that the emperor has no clothes. They may see it and dare to say it out loud to those who believe it is possible to continue in denial. But while listening to the sound of the collapse of a dying world cannot be avoided, not least because the noise is all-encompassing and is experienced daily through suffering in the flesh, it is not so with the sound of the re-emerging world. To hear that you need other ears. We are not looking at another version of what we know. It is not a new twist, a bend in a familiar path. It is something new and radical. Its deep roots in the past are not dedicated to reproducing the past, or even worse, making an impossible attempt to return to it. It is something else (es otra cosa). As was shown last Friday, the new world will be built with hope, joy and celebration, through the discipline which is learned through their own order, autonomy. Only then, through organic discipline, which is woven from below by their own will, it is possible to propose the elimination of coercive power and authority, the condition in which a hierarchical position is used to impose action. In dark times like these is a blessing to know we can rely on them. As Chomsky, Wallerstein, Gonzalez Casanova and many more said long ago, the Zapatista political initiative is the most radical in the world, and probably the most important. That was yesterday, that night of the first of January 1994, which triggered a wave of anti-systemic movements throughout the world and woke us all up. They continue doing so today, when they are once again an inspiration to do what is needed. The end of an era has arrived. The evidence is accumulating daily. Nothing can stop its conclusion. But it will acquire an apocalyptic form, deepening the immense natural, social and cultural destruction which has been characterizing its agony, unless we are able to resist such horror. And in these circumstances, the only valid and effective way to resist is to create an alternative. We all have to do this. Each in his own place and in her own way. We need to dissolve the economic and political relations which trap us in the old world, while being increasingly aware that the dignity of every man and every woman and every human relationship must of necessity defy all existing systems. That is what today is about. December 21, 2012 – Zapatistas mobilize in Silence. Zapatista communities march throughout Chiapas while indigenous people unite all over the Americas in dignity. In San Cristóbal De Las Casas thousands shutdown the streets in silence. Only the resonating echo of rain pattering down on the cobblestone streets of Chiapas’ colonial cities sounded as tourists from around the globe awaiting the end of the world in the center of the Mayan Civilization were surprised by the silent marches of more than 40,000 masked Mayan Zapatistas who descended on their apocalyptic misinterpretations of the Mayan 13 Ba´ktun.A faint sound of a baby’s cry would occasionally emerge from a bundle beneath a plastic tarp on the back of a masked Zapatista in the endless lines of Mayan rebels who quietly held formation in the rain. They marched four file booted and bare-footed into the same cities they surprised on a cold new year’s eve night 19 years ago, shouting their first YA BASTA! Yesterday’s weapon, differing from the 1994 armed indigenous uprising, was the Zapatista silence, their moral authority, the echo of a unified and deafening silence that shouted YA BASTA! once again. A silence that in their massive presence in San Cristóbal de las Casas, Ocosingo, Altamirano, Las Margaritas and Palenque shouted without a word that the a new Mayan era has begun and the Zapatistas are present. A silence that was meant to remind Mexico’s recently inaugurated President Enrique Peña Nieto and his PRI party that the root causes of the Zapatista struggle are as prevalent today as they were 19 years ago: lack of health care, education, housing, land, food, indigenous rights, women’s rights, gay rights, dignity, and justice. A silence that reminded the returning PRI that there is a Mexico profundo, a Mexico jodido, a Mexico con hambre, and a Mexico dispuesto a luchar and in struggle. The Zapatistas and the EZLN need not say a word today, their actions and silence said enough. Aqui estamos! As early as 4 a.m. the Mayan indigenous, Tzeltales, Tzotziles, Tojolobales, Choles, Zoques, and Mames began their mobilizations from their five cultural centers of resistance, known as Caracoles, emerging from the Lacandon jungle, the Chiapas Canyon lands, and the rain soaked highlands. They quietly moved along the mountainous, fog-bearing roads towards the same cities (plus Palenque) that they descended upon when these ill-equipped ragtag rebels launched their armed uprising on January 1st 1994, the day the North American Free Trade Agreement went in to effect. There were no visible Zapatista Commanders in the marches, no words spoken, no chants could be heard, nor banners seen. Only two flags accompanied the thousands of Mayan rebels, a Zapatista five pointed red star on black and the Mexican flag. The same scenario could be seen in each of the five cities that the Zapatistas descended upon despite the unusual rains for the beginning of the Chiapas dry season. The Zapatistas arrived, marched on the city centers, built make-shift stages on top of cars and marched thousands of Zapatistas four by four, fists in the air, over the stages in front of their flags. Then, as quickly and quietly as they arrived, the Zapatistas disappeared into the fog and rain that camouflaged their arrival. That is the sound of your world falling apart. It is the sound of our resurgence. The day that was the day, was night. And night will be the day that will be the day. Tim Russo is a long time media activist, photographer and journalist. Russo has covered Mexico and Latin America for over twenty years. He is on the Board of Directors of Free Speech Radio News www.fsrn.org, regularly contributes to KGNU in Boulder, Colorado and is active with the Red Mesoamericana de Radios Comunitarias, Indígenas y Garifunas. As the Maya calendar ends, a new cycle of struggle begins with thousands of Zapatistas peacefully and silently occupying town squares across Chiapas. The Zapatistas are back! Flowing like the water of the river that beats the sword. And while some were anticipating the Christmas holidays, some others the end of the Maya calendar, and others still the new Communiqué from the Comandancia General of the EZLN that was announced back in November, the main cities of Chiapas woke up today with memories of 1994. New Age freaks around the world may have been gearing up for the end of the world, but it appears that some Mayas had a very different opinion on the matter. They preferred to send us another message: that of the new world they have been building in silence for two decades now. Since the early hours of the 21st of December 2012, thousands of Zapatistas from the Bases of Support of the EZLN — their faces covered with the legendary Zapatista pasamontañas and paliacates around their necks — started marching in silence, in perfect formation, entering the cities of San Cristóbal de las Casas, Ocosingo, Las Margaritas, Palenque, and Altamirano, and occupying their central squares. Those were the same squares, in the same cities, they had occupied during the Zapatista uprising on the 1st of January 1994. This time, though, they marched peacefully and in silence, under the heavy rain of the Chiapaneco December and the praise of the citizens of the cities. After a silent march through the towns, the Zapatistas headed back to their communities, equally silent as they appeared. This is the most impressive Zapatista mobilization since May 2011, when — together with the Movement for Peace, Justice, and Dignity of the poet Javier Sicilia — they gathered more than 30.000 people in the central square of San Cristóbal de las Casas in a manifestation against the “War on Drugs” of Felipe Calderon that has already cost Mexico more than 70.000 deaths. Right now we are expecting the Communiqué of the Comandancia General of the EZLN, but what is certain is that today’s impressive silent mobilization is the Zapatistas’ response to the increasing repression their communities have been facing from the government and its paramilitaries over the past years, in combination with the return of PRI — the party against which the EZLN initially mobilized in 1994 — to government. It is the sound of their world collapsing. It is that of ours rising anew. The day that was the day, used to be night. And night will be the day, that will be the day. Hwever, “we only encountered more violence,” the indigenous added in their message. “The lord of Xibalbá (the bad government) developed strategies of death and extermination” with what is called Campaign Plan Chiapas 94 that, from 1995 to 1997, “militarized our communities and municipalities, and with it they formed the paramilitaries that came out of our communities armed and trained by the Chiapas police and the Army, and financed by the federal government.” Later, “the paramilitaries massacred us.” They remember that “45 of our brothers and sisters, four of them pregnant” died. Indigenous Tzotziles, from the Las Abejas organization, marched at the anniversary of the Acteal Massacre. Fifteen years after the massacre, the government still denies that it is a State crime, “and far from doing an in-depth investigation, it continues with its counterinsurgency strategy of harassing the survivors, creating division in the communities and organizations that struggle.” This attitude: “spoils real justice and the recognition of the truth” and forther encourages the paramilitaries. With respect to the current governor of Chiapas, they indicated that: “although Manuel Velasco Coello on taking his oath of office has greeted social movements, especially our Zapatista brothers, it doesn’t mean that he is going to respect indigenous peoples or comply with the San Andrés Accords”. Las Abejas have reason to distrust when governors “mention social organizations and movements.” His predecessors Pablo Salazar Mendiguchía and Juan Sabines Guerrero, “what they did was administer the inter-community conflicts that originated through the strategy which the Mexican State implemented against the Zapatista Uprising”. English translation by the Chiapas Support Committee for the: International Zapatista Translation Service, a collaboration of the: Chiapas Support Committee, California, Wellington Zapatista Support Group, UK Zapatista Solidarity Network. Expressing its solidarity with the Zapatista peoples, the political prisoners of the Other Campaign and Las Abejas of Acteal, the Movement for Peace with Justice and Dignity (MPJD) demonstrated its concern about the possibility that the new security strategies of Enrique Peña Nieto’s federal government could serve as a justification for attacking the autonomous Zapatista municipalities. The caravan of activists demanded the departure “of the paramilitary groups from Unión Hidalgo, who, equipped with arms for the exclusive use of the Army, have with great violence provoked the displacement of entire families, and once they had expelled them, they have been distributing their lands, houses, animals and 11 hectares of corn, robbing and harvesting what does not belong to them.” In the same way it demanded “the immediate withdrawal of members of the police”, who “openly support the paramilitaries”. A central demand of the caravan, which arrived in this city today, is “the immediate liberation of the compañeros Francisco Santiz López and Alberto Patishtán, worthy examples of those who embody the dignity of being human and who have been imprisoned unjustly for struggling for their rights”. On concluding the press conference, the caravan visited the Zapatista and Other Campaign prisoners in the San Cristóbal de las Casas prison. Samuel Ramos, comunero from Cherán, also took the word, as well as the father of Melchor Flores (the Galactic Cowboy), a mountain region youth who disappeared after being apprehended by the police in Monterrey. Directing himself to the Zapatista Juntas, Señor Flores remembered that his son sympathized with the EZLN and on one occasion wanted to come to the Chiapas communities. “I told him that he should not do it, that he shouldn’t get involved with the problems. And now I am the one that is here,” he said, underscoring the apparent irony of the fact. December 21st, 2012, was the last day of Baktun 13 in the Long Count of the Maya. We do not know what time the thousands of Zapatistas began arriving who would occupy the municipalities of Ocosingo, Palenque, Las Margaritas, Altamirano and San Cristobal de las Casas. What we do know is that from eight o’clock they began to become visible, to carefully take their assigned places in ranks and contingents. In the city of San Cristóbal the contingents ranged from the newly built Soriana to beyond one of the entrances to Huitepec on the periphery of this city. Men, women and children came down from their communities amid a stubborn cold and rain that would not stop all day. And so, with their balaclavas embroidered with numbers marking the group to which they belonged, and all in perfect order, they began to advance again on the proud city of Jovel. The grey, the storm that awaited them this day will remain symbolic. This is how the world looks and feels these days, particularly the national reality. The return of the PRI to power (which is almost at all three levels in Chiapas), the labour and educational reforms, the imminent threat of the dismantling of what remains of the ejido (in the form of land law reforms proposed by Calderon in his days leaving office), the repression and criminalization of social protest under the PRI reloaded, and the deepening of the extractive industry, read open looting of natural resources. So grey and stormy is the picture. And in the middle of the night the Zapatistas appeared once again. In silence, and in perfect order, they withstood the rain, cold and wind, just like they resist. The columns advanced, the rivers of people, balaclavas and bandanas. At their passing, supporters came out who have felt called by Zapatismo. There were also journalists and tourists as in 94. Many businesses closed their doors, such is the fear of the coletos. But there were also those, though few, who greeted the contingent from the doors of their businesses. When the columns reached Plaza de la Resistencia, a Zapatista brigade had already erected a simple little platform. The vanguard that carried the Mexican and Zapatista flags were the first examples of what would become a display of dignity. All the columns passed over that platform, each and all of the thousands of Zapatistas who came to San Cristóbal went up and down with their left fist held high, amid a silence that was broken only by the sound of their footsteps going up and down hastily. That and occasionally some slogan from supporters who watched bewildered, wondering what time the communique would be released, as announced so well on the Enlace Zapatista page. However, this action was the communique: the strong and wise message sent not only by the General Command of the EZLN, but also by the Zapatista support bases. The EZLN who resist, walk and construct are the collective subject who raise their left fist as if to say: we do not give up, we are not beaten, we are still here. On the streets around the central plaza the Zapatistas kept coming, after hurrying to take their place in an act that seemed to have been rehearsed many times and yet had not seen the scene until that day. The organizational effort of mobilizing thousands of people in a ceremony full of symbolism and dignity contrasts like never before with all the emptiness and cynicism of the government’s actions. The ice rink built by the municipal government, occupying almost half the cathedral square can also serve as a metaphor: a very expensive white elephant definitely built for tourism, with funds from the public purse in a bankrupt state, the rink is not only out of context but is also a useless occupation-usurpation of public space. And what happened during the Zapatista mobilisation? The white elephant remained, while the Zapatista mobilisation overflowed the streets, the limits: the entire centre was taken. Little by little, just as they arrived, the thousands of colours that are the Zapatistas emerged silently from the city to return to the mountains. They left behind again the grey chaos which reigns. But they have fertilised the seed of hope which they planted many years ago. What has never gone away cannot reappear. The Maya Zapatista rebels occupied five cities in Chiapas peacefully and in silence this December 21 not in order to reappear, but to reaffirm their strength. The EZLN has been here for more than 28 years. It has never has gone away. For ten years it grew underground, over 18 years ago it became public knowledge. Since then it has spoken and kept its silence intermittently, but it has never stopped doing so. Again and again its disappearance or irrelevance has been decreed, but it has always re-emerged with strength and with a message. This start of the new Mayan cycle was no exception. More than 40,000 Zapatista supporters marched in the rain in five cities in Chiapas: 20,000 in San Cristobal, 8,000 in Palenque, 8,000 in Las Margaritas, 6,000 in Ocosingo, and at least 5,000 more in Altamirano. It is the largest mobilization since the emergence of the rebels in south-eastern Mexico. The magnitude of the protest is a sign that their inner strength, far from diminishing over the years, has grown. It is an indication that the counterinsurgency strategy against them, conducted by various governments, has failed. It shows that their project is a genuine expression not only of the Maya world, but also of that of many poor mestizo peasants in Chiapas. The EZLN has never left the national scene. Guided by their own political agenda, true to their ethical stance, and with the force of the state against them, they have strengthened their forms of autonomous government, and kept alive their political authority among the country’s indigenous peoples, and kept active their international solidarity networks. The fact that they have not appeared publicly does not mean they are not present in many significant struggles in the country. In the five good government juntas that exist in Chiapas, and in the autonomous municipalities, the support base authorities govern themselves, exercise justice and resolve land disputes. In their territory, the rebels have run their health and education systems outside the state and federal governments, organized their own production and marketing and retained their military structure. They have successfully resolved the challenge of the next generation of commanders. As if this was not enough, they have effectively weathered the threats of drug trafficking, public insecurity and migration. The book “Very other” struggles, Zapatismo and autonomy in the indigenous communities of Chiapas is an extraordinary window into some of these experiences. The Zapatistas marched on December 21 with order, dignity, discipline and cohesion, and in silence, a silence which was heard loud and clear. In the same way as they had to cover their faces in order to be seen, now they interrupt the word in order to be heard. It is a silence which expresses a fertile capacity to generate other horizons of social transformation, one of great power. A silence which communicates the will for resistance against power: “he who remains silent is ungovernable”, said Ivan Illich. A cycle of political struggle in Mexico closed on the first of December, while another opened. The EZLN has much to say in the emerging map of social struggles which has begun to take shape in the country. Their mobilization can impact on these in a relevant way. Among the contours that define the new era of social struggles are: a return of the old PRI dinosaur to Los Pinos, piloted by Salinismo and its authoritarian modes of the exercise of state control, the pretence of driving social unrest from a pact among elites that excludes the subordinates, the crisis, decomposition and reorganization of the parties of the left, and the emergence of new social movements. The EZLN is a new player who, without invitation, sits at the table of the game that just opened in national politics. The Pact for Mexico, signed by the Institutional Revolutionary Party (PRI), National Action Party (PAN) and, individually, by the president of the Party of Democratic Revolution (PRD), aims to agree a programme of extensive reforms outside wide social sectors. The mobilization of the EZLN makes it evident that a very large part of Mexican society is not included in that agreement, and that what its subscribers have agreed does not necessarily have the support of the citizens. The Aztec sun party is engaged in an internal struggle which could cause it to fall apart. The pretension of the New Left is to yoke its destiny to the Peña Nieto government without any possibility of a critical distance from power. The National Regeneration Movement (Morena) has overturned its organizational tasks for registration. Probably the Popular Organization of the Workers (OPT) will follow the same path. There is thus a broad political and social territory which the parties of the left are not occupying. The Zapatistas enjoy an undoubted political authority among those who inhabit these latitudes. In the last year and a half social movements have emerged to challenge power outside the political parties. They do not feel represented by any of them. The Movement for Peace with Justice and Dignity, # YoSoy132, community struggles against public insecurity and the devastation of eco-logic, the student protests in defence of public education, among others, are all walking different paths from institutional policy. The sympathies for Zapatismo among these forces are very real. But far beyond this coming together, the marches of the Maya Baktun 13 are a new “Enough!” like the one cried out in January 1994, and a renewed version of the “Never again a Mexico without us!” formulated in October 1996, one which opens up other horizons. They ask for nothing, they demand nothing. They show the power of silence. They announce that one world collapses and another is reborn. More than 40,000 Zapatista support bases filed silently this morning through five Chiapas cities, in what was the most numerous mobilization of this organization since the Zapatista National Liberation Army’s (EZLN) armed uprising on 1st January, 1994. Coming from the five Zapatista Caracoles in the Lacandón Jungle, Los Altos and the Northern Zone, the Maya peoples in rebellion (Tzeltales, Tzotziles, Choles, Tojolabales, Mames and Zoques) of Chiapas occupied the central plazas of Ocosingo, San Cristóbal de Las Casas, Palenque, Altamirano and Las Margaritas; in each case, in complete silence. At 6:30 in the morning, about 6,000 indigenous Zapatistas, in the majority young people, concentrated near the University of the Jungle, near the Toniná archaeological site. From there they marched to the central park of Ocosingo, where they stayed for a space of three hours in front of city hall, which the EZLN’s insurgents and milicianos took over with arms 19 years ago when they declared war on the Mexican government. On this occasion the action was civil and peaceful, and the only ones who spoke were the raised left fists of all the Zapatistas, who filed in order onto a platform that they had installed for that purpose. Around 10:30 am, the last of the demonstrators abandoned the plaza, on their way back to the Jungle. In the same way, at the other plazas mentioned the Zapatistas erected platforms which all the participants in the mobilization mounted with raised fist, in a parade of impressive conciseness. Some 20,000 Zapatista men and women marched in San Cristóbal de Las Casas. According to reports, at least 7,000 indigenous congregated in Las Margaritas, and 8,000 in Palenque. The number in Altamirano is not known. According to the testimony of a transport worker (driver) from the Ocosingo zone, twice the number of indigenous who arrived in the municipal headquarters of Ocosingo could have left from the Caracol of La Garrucha, but there were not enough vehicles, therefore only 6,000 people were transported. 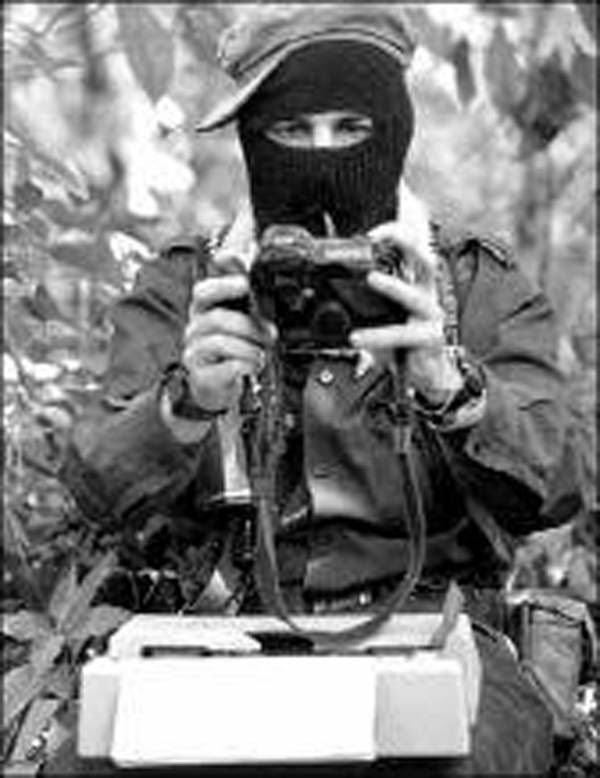 Intermittently, throughout recent weeks, the Enlace Zapatista website has been announcing “the word” of the EZLN’s Indigenous Revolutionary Clandestine Committee-General Command (Comité Clandestino Revolucionario Indígena, Comandancia General del EZLN), as well as of the Sixth Commission and the International Sixth Commission. It is expected that these communications could be announced soon, but it has not happened yet. On the date when many gullible people in the world believed that the world could end, according to the opportunist interpretation of the “prophesies” (in reality, mathematical calculations) of the ancient Maya, the EZLN support base communities, belonging to the contemporary Maya peoples, who in their languages call themselves “true men,” carried out a powerful demonstration of power and discipline, with their faces covered, in perfect formation under the persistent rain (unusual at this time of the year) which accompanied the mobilizations in the different localities throughout the morning. Able to “appear” suddenly, the indigenous rebels “disappeared” as beautifully and silently as they had arrived in the early morning in this city which, two decades after the EZLN’s traumatic irruption here on New Year’s Day 1994, received them with bewilderment and curiosity, but without any expression of rejection. Under the arches of the city hall, which suspended its activities today, dozens of Ocosingans congregated to photograph with cell phones and cameras the spectacular concentration of people with covered faces who filled the park like in a game of Tetris, advancing among the gardeners in an order that appeared choreographed, to go up to the platform quickly installed since very early, raising their fist and saying, silently, here we are. One more time. The EZLN has returned to speaking in silence. The facts: the Zapatistas gave the largest show of strength they have made in the nearly 19 years since they first appeared. They focused on five municipal headquarters: San Cristobal de Las Casas, Las Margaritas, Ocosingo, Palenque and Altamirano (four of them taken on 1 January 1994). In all these places they paraded in chilling silence. Not a word escaped their lips. In front of the municipal presidencies they built a stage on which they all marched with their fists raised. They returned this afternoon to the caracoles where they belong. And then they unveiled their word: it is the sound of their world collapsing. It is our resurgence. The symbols are many, they chose the last day of the Mayan cycle, which for many represented the end of the world and for others the beginning of a new era, a changing of the skin, a renewal. During these 19 years the course of the Zapatista struggle has been full of symbolism and prophecies, and this occasion should not be the exception. Since the announcement that the General Command of the Zapatista Army of National Liberation (EZLN) were to release their word, the expectation of the content of this message has been growing. This Friday, however, what we heard were their steps, their silent walk traversing five plazas, their dignified and rebel passage through the streets, their fists raised, their massive and iconic presence with their faces covered which, although not a new image, remains impressive. Strength, discipline, extraordinary order, dignity, integrity, cohesion. It is not a little. There have been 19 years during which they have many times been given up for dead, divided and isolated. Time and again they came out to say here we are. The last time was May 7, 2011, accompanying the Movement for Peace. At that time there were more than 20,000 of them demonstrating. Today there were, at least, 40,000. The largest mobilization in their history. They have now given their word, or started to. Their most recent political initiative was the Festival of Dignified Rage, to which they convoked struggles and movements in Mexico and the world, in December 2008. On Friday no members of the CCRI made themselves known, as they did plainly in May 2011. This was the last time you saw Tacho, Zebedee, Esther, Hortencia, David and the rest of the general command, with the exception of Subcomandante Marcos, who has so far kept away from the public eye. DID YOU HEAR IT? It’s the sound of their world ending. It’s that of ours resurging. Communiqué of the Clandestine Revolutionary Indigenous Committee – General Command of the Zapatista Army of National Liberation, Mexico. It’s the sound of their world ending. It’s that of ours resurging. The night will be the day that will be the day. Today, when many people around the world claimed, errantly, that a supposed “Mayan prophecy” predicted “the end of the world” for this date, 50,000 authentic Mayans in Chiapas, Mexico, came down from the mountains and marched in silence. They were from the rebel Zapatista indigenous communities and they marched in the cities of San Cristobal de Las Casas, Ocosingo, Comitan, Las Margaritas and Altamirano – the same five cities that on January 1, 1994 the Zapatista Army of National Liberation took through a guerilla attack.